I often find myself EXTREMELY conflicted when it comes to sequels. A huge portion of my brain knows they are normally a bad idea, doing nothing but diluting a story and its characters while tarnishing a unique original movie in the pursuit of more dollars. But there is also a deep dark corner, tucked well away from my rational thinking, that still CRAVES sequels to certain movies like a rabid, drooling animal! It’s an unavoidable emotion, wanting more of a good thing in the hope it will continue to be good. There exists a shrinking number of legendary movies that have never had what you would call a sequel. Sometimes the worlds they created have been revisited in the form of prequels and remakes, but an actual continuation of the story has never been attempted. In my opinion the most obvious example of this, which often triggers the mental conflict I mentioned above, is John Carpenter’s The Thing. 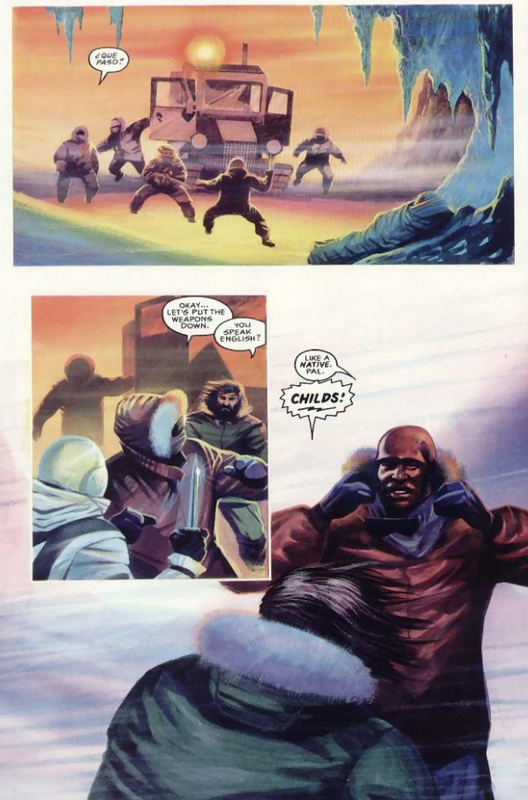 In 1991 Dark Horse Comics decided they were going to have an attempt at answering that question with the release of a two issue mini-series called The Thing From Another World. The script was written by Chuck Pfarrer and the magnificent artwork was produced by John Higgins. Between them they created a direct sequel to Carpenter’s masterpiece that I have always loved, and is probably better than anything Hollywood would have come up with given the opportunity. Chuck’s story is lean and mean, containing plenty of the paranoia and distrust that made the movie so special, while John’s art is just sumptuous, fully painted and epic. 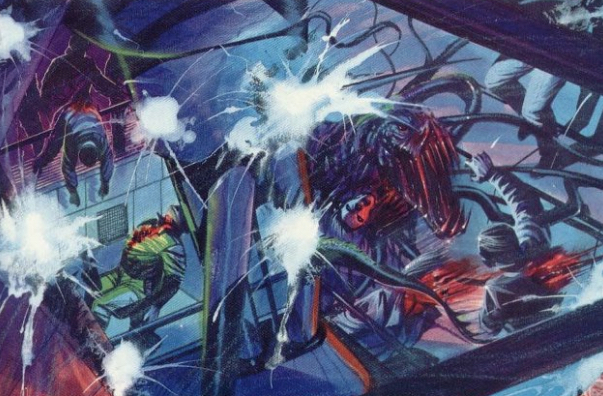 He illustrates the alien transformations in a way that captures its hellish and chaotic form perfectly, bringing life to every deadly panel it appears in. He’s an artist I grew up with due to his work within 2000ad on Judge Dredd, and from there he would go on to be a part of industry changing publications such as Watchmen and Batman: The Killing Joke. I recently had the opportunity to send John a few questions, and despite his hectic schedule he was able to provide a wonderful little insight into the creation of The Thing comic book and his work in general. Take a look! Halloween Love: First of all can you tell me a little about your artistic journey, do you think it was a destiny from a young age? JH: Always. I sketched, scribbled (and dribbled) and drew from an early age. In school if you were good at art it gave you a certain cachet. As I had no perceivable talent for any other educational or school activity it gave me a sort of lowly position in the school hierarchy, without that drawing ability I cannot imagine how low down I would have been. Maybe that sowed the seed of being a comic artist, to be noticed but in a quiet way. 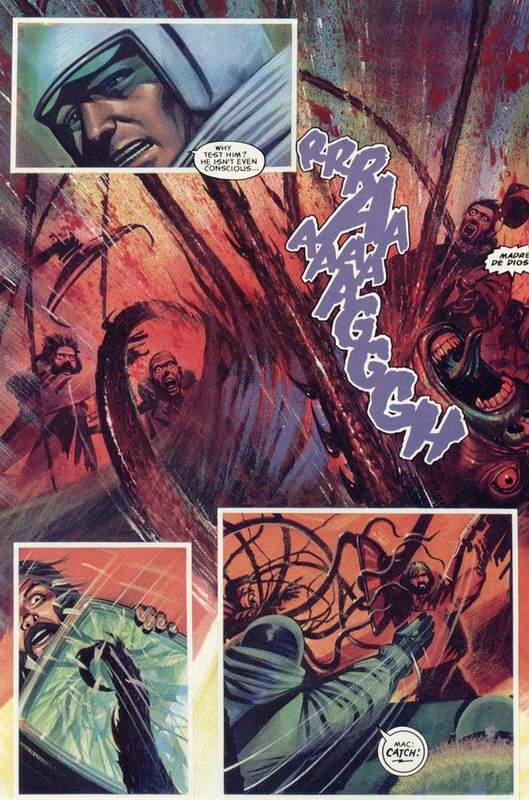 HL: The first time I experienced your art it was within a Judge Dredd Annual, 1988 I believe. It was a big fully painted piece featuring a very dark, and at times brutal adventure for Dredd. Can you tell me what it was like working on Dredd back in the day, and if you recall much about the Annual story – “Last Of The Bad Guys” ? JH: I am very gratified by how many people still remember and mention the 1988 Judge Dredd annual story. For me it was a career changing project, a number of things came to a head at that time, for me as a developing comic artist and also becoming a technically proficient painter. How to tell a dramatic story in the most effective way was starting to make sense to me, I was making decisions on the best place to position the viewers eyes, close up, long shot etc. And on the technical side of the full color painting process I was starting to see the right methods to achieve the best result. It was a less of a hit and miss approach to laying down the paint, knowing what the materials would do for me was now part of my knowledge, that not only saved me time but also my layout decisions were now not based on any technical limitations I might have as an artist but they were made solely on what made the best image for that part of the story. Also the writers John Wagner and Alan Grant had an approach to the storytelling that showed the maturity of not only their writing but also showed how much depth Judge Dredd, this most iconic of British comic characters had. Along with the editor Steve McManus they had created a platform of excellence that was showing what could be done in comics, and that it did not have to be limited by the perceptions of what a children’s comic at that time were expected to be. Steve not only showed his confidence in my ability to tell such a story, but also the editorial freedom he gave to all 2000AD creators in such a censorial field as British comics were in those days, this gave every contributor a creative incentive to be the best they possibly could be. I felt I had risen to the occasion maybe for the first time on this story. 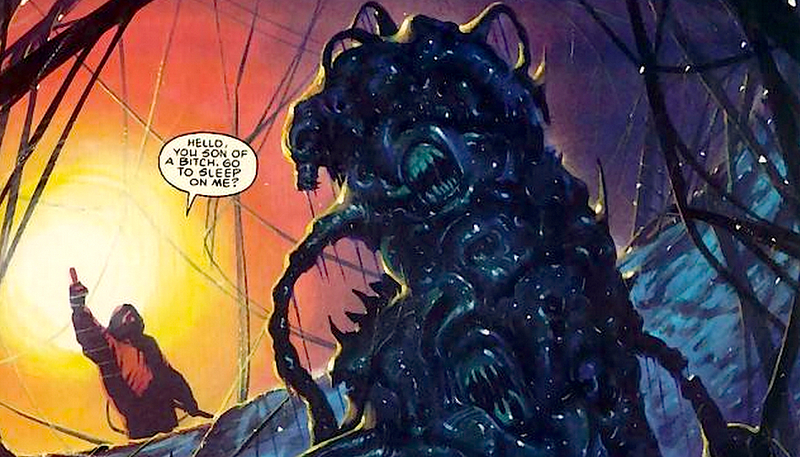 HL: I contacted you because of my huge fondness for ‘The Thing From Another World’ published by Dark Horse comics, which acts as a direct sequel story to John Carpenter’s incredible movie. Can you tell me how you got the job and if you had been a fan of the movie previously. 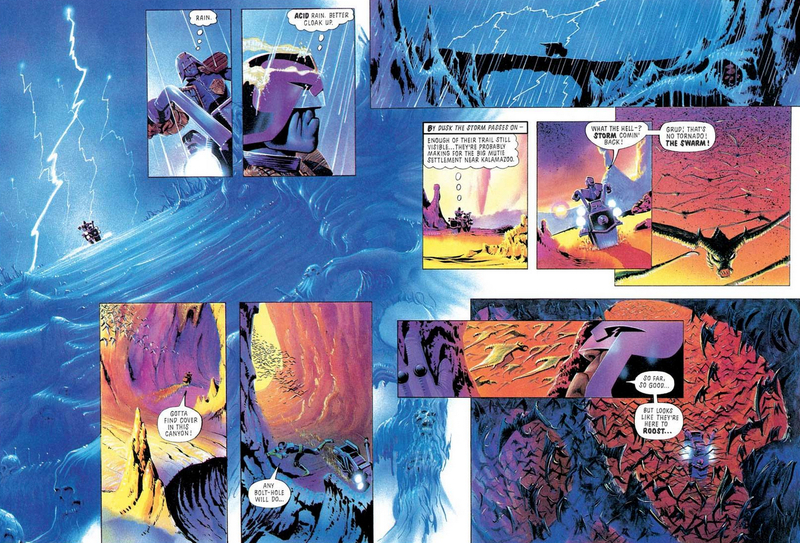 JH: I have just spent the last 2 weeks filing away all my original artwork, and the 1988 Dredd story along with The Thing From Another World are still in my collection and I have no doubt they are both still amongst the best full colour painted strip work I have ever done! Dave Gibbons introduced me to the Dark Horse publisher Mike Richardson, (networking helps to get work, but you have to be able to produce the goods), and I know the 1988 annual art proved to Mike that I had the artistic chops to do such a commission. I think The Thing From Another World is in my top 5 of all time favourite SF/horror movies. 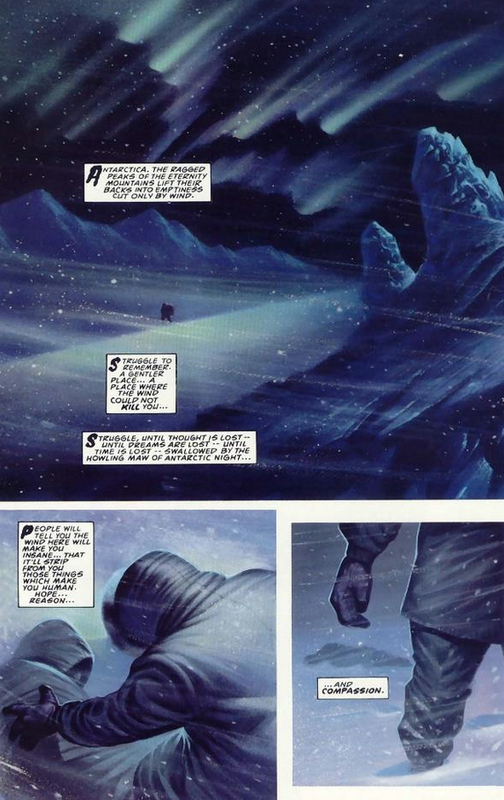 HL: You painted the entire story over two issues, resulting in some incredibly atmospheric and rich art. Is that a long process, and do you think that kind of work is becoming a thing of the past within comic books? JH: Thank you for that compliment Martyn. I was pushing myself as a artist at this time, particularly after working on the Watchmen in 1986, my understanding of the use of color in relationship to storytelling had grown. Along with this, the experience of the 1988 Annual work had given me confidence to try different paint media and technique on the basis of what I had learnt. 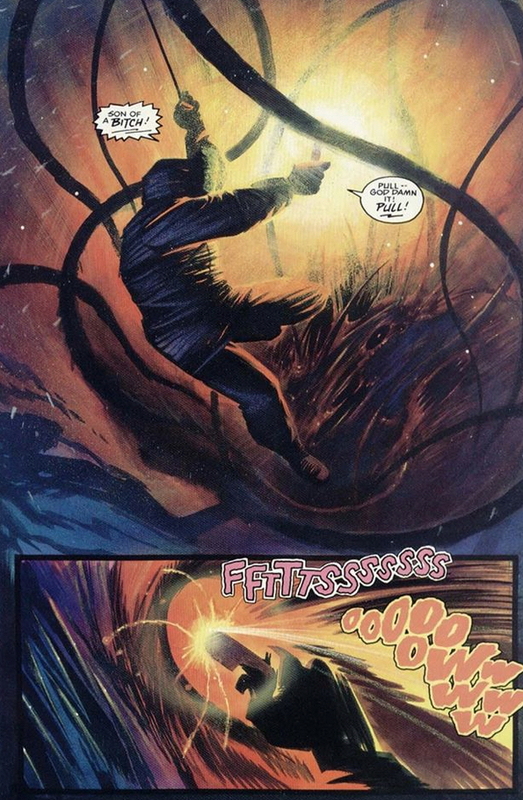 The 1988 annual was mainly painted in Gouache and Magi color permanent inks. The Thing From Another World was mainly Acrylic Paints, Liqitex and Magi color inks. This gave a faster finish time on page production. I used more wash techniques which also saved time, so I was probably as fast as I could possibly be on producing a page of fully painted color comic artwork, to a standard I was happy with, but it still took 3 to 4 days to produce a page of Thing art. On the 1988 annual it was probably 4 to 7 days a page, as much because of the different paint techniques I used at that time. So for full color painted comic work, The Thing was another major learning curve. I don’t think I painted any large page count comic strips after that, just because it was so time consuming. I’m afraid that was one of the lessons I had learnt on both of those stories, and the page rate was not enough to give you a return on your time investment. If you got past a certain production speed trying to earn more, the work would suffer and I personally could not allow that to happen for my own artistic integrity and pride, plus people would stop commissioning you if the standard fell too much. I think for that reason you will not see such work being produced in the commercial comic field again. I think it is still possible you will get an artists labour of love project, but I can’t see any publisher paying the page rate to an artist that would allow him to produce traditional color comic work to a standard that would satisfy the artist AND publisher. I do think we are seeing some exceptional digital color artists who can create a feeling of traditional color, but in ACTUAL traditional painted work there is always a chance of that lucky accident or ‘mistake’ that you have to go along with to try and ‘save’ – otherwise the page is lost and you have to start all over again. Sometimes as an artist you WANT to experiment with paint to see what might happen if you do try this wash effect or that brush stroke, and when a lucky accident happens you suddenly find a wonderful effect that you didn’t plan for. You will never get these moments in digital work because if a mistake happens you press command Z and the file steps back and it’s gone. This for me limits what a digital artist can do, no matter how good they are or how intuitive digital painting programs might become. HL: Do you think we will ever see an official sequel to Carpenter’s movie? Should it be left well alone now? JH: I think we will see one, but we all know that for every Aliens movie, there are twenty Frankenhooker movies. If we got someone like John Carpenter, who was a fan of the original 1950’s movie and is also a talented director, we could get a great sequel. I have two The Thing From Another World comics in my hands that would make a good starting place for a sequel!! The writer of the series was Chuck Pfarrer, who is an experienced movie screenplay writer with a number of action / horror movies to his credit. I think the way his script led from the end of the original movie to the start of the graphic novel had a neat continuity that would have made a pretty good movie. HL: Do you have a passion for horror? And do you have a favourite horror movie, or at least a favourite ‘type’ of horror movie? JH: I do have a passion for horror, and for humor in horror. I think they are so close physically, and can generate the same adrenalized release, an explosive laugh or a gasping jump out of your skin reaction. 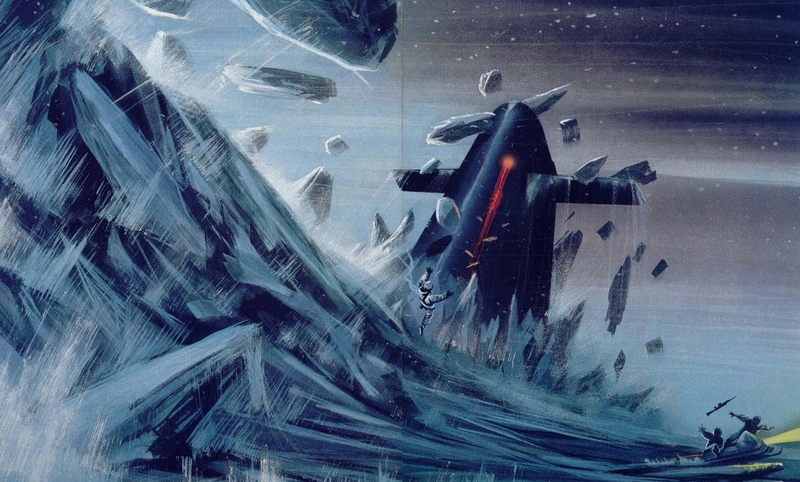 The horror I enjoy most is science fiction horror – The Thing, Alien/Aliens, Event Horizon. And Supernatural horror such as Hellraiser, the original Omen, The Shining. Horror that has a realistic premise is not my favorite kind, unless it’s stylishly done like The Silence of the Lambs. I absolutely dislike torture horror such as the Saw and Hostel series, I hate powerless victims. I prefer horror that shows IF a character has to die, it is to a powerful evil that you can’t do anything about. Or, when the character can survive if they have certain attributes that make that survival a possibility. HL: Finally, what does the immediate future hold for you? Any plans or projects you can tell us about? JH: I am going to be doing more of my Razorjack series, it is the most satisfying project I have ever done as a creator, allowing for rekindling past collaborations that have been exceptional experiences with great talents such as Garth Ennis on Hellblazer, or Jimmy Palmiotti and Justin Grey on The Hills Have Eyes graphic novel, and a few other projects with my favourite writers, but all of these past team-ups had the disadvantage of being work for hire and usually set in a franchised world owned by the publishers. What I love about the Razorjack world is to be in control of my own characters and my story. Plus I do still collaborate with other talented creators who have been bought into my Razorjack nightmare. Such as Michael Carroll, a wonderful writer who is starting to make a name for himself in comics publishing. He has had a reputation in SF book publishing for quite a while, so look out for future Razorjack projects and don’t forget to let me know what you think. Here is a link to Titan Comics latest Razorjack graphic novel – at a splendid discount off the cover price! I want to say a HUGE thank you to John for making this chat possible. I’ve admired his work for a LONG time and am genuinely thrilled we made this happen. Until next time, stay safe, and keep it horror!